As I begin further researching Books of Common Prayer, I have already come across some interesting things. Unfortunately, some of my predictions and assumptions from my first post have not panned out, but I have quickly found new questions and ideas to pursue. First, in my last post, I assumed that people knew what a Book of Common Prayer was, which you wouldn’t unless you are Anglican/Episcopalian. The Book of Common Prayer (BCP) is used in the Anglican communion. It is a book that holds the liturgy for all of the services and other prayers. As an Episcopalian myself, I thought it would be interesting to focus my research on these books. One year for my birthday, my parents gifted me my own Book of Common Prayer (unfortunately without a fore-edge painting). With this information in mind, it is safe to say that BCPs are quite common. They were mass printed to be used in churches and for personal collections. Because they are so common, it makes sense that so many of them have fore-edge paintings. 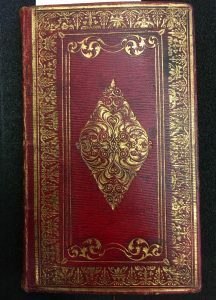 While a regular BCP may not be very rare or special, adding a fore-edge painting to the book would make it more unique. Adding fore-edge paintings was a way for people to personalize their BCPs or for publishers or book dealers to sell more BCPs by making them more distinctive. When I began my research, I started just by googling “book of common prayer fore-edge painting” and was surprised to see dozens of fore-edge painting BCPs for sale. These books are all over the internet with different paintings garnishing their pages. 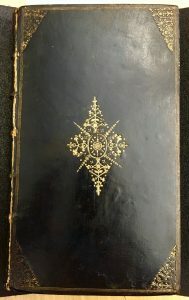 I find it ironic that a tactic used to make these books more unique and rare had become so mundane that it is quite easy to find a Book of Common Prayer with a fore-edge painting today. 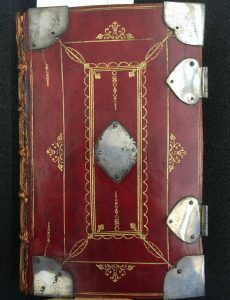 Nevertheless, it can be argued that these fore-edge painted books are still more valuable than those without paintings. However, when scrolling through all these images of fore-edge painted BCPs, I found that most of them were horizontal landscape paintings. Out of the three BCPs I am focusing my research on, only one has horizontal landscape paintings, but it is a split fore-edge. The other two books have a vertical painting of a figure with zodiac signs and a horizontal painting of coats of arms. These paintings seem to be more rare on BCPs than just plain landscape paintings. Below are photos of the books and their dimensions.